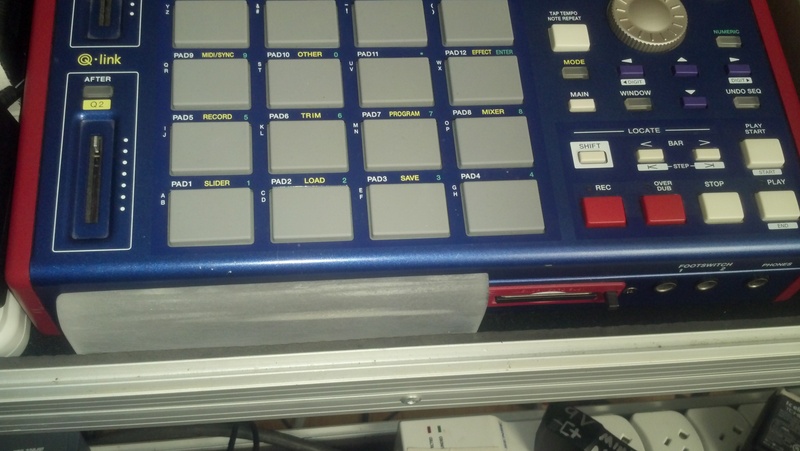 I’ve spent many months learning how to use the MPC fully as if I’d play it directly with my hands. I’m controlling it less directly with my drumkit, mostly via MIDI, and I’m struggling to effectively exploit all its conncections. Here we review some of the finer points of how I’ve adapted it to my drumkit, and a special modification to mount it. the MPC’s ample analog INs and OUTs created some unique opportunities and challenges. 4-lead loom of XLR from dDrum triggers into trigger converter. 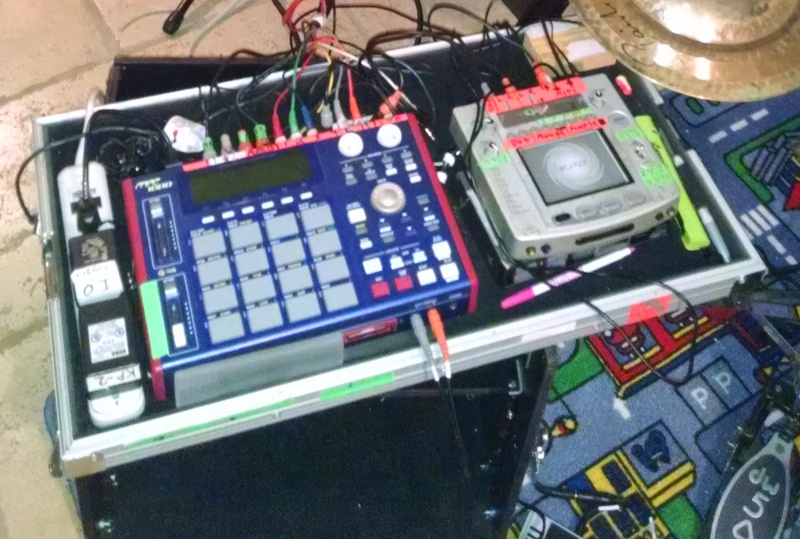 …I have also developed an effect loop on the MPC control, with MIDI control. The KP-2 is fed by the 4th sub/individual out of MPC, returning back to MPC’s inputs; This lets me assign various specific samples (triggered by specific drums/pads) to route to the hardware fx loop, and this is Drum Program specific. 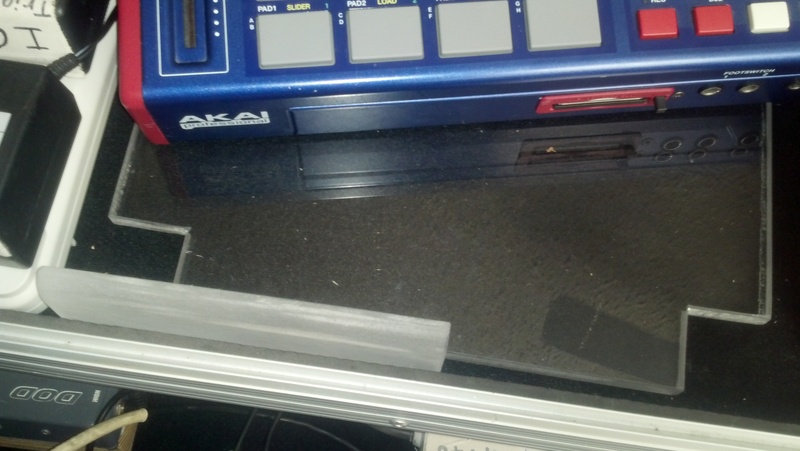 Each Pattern can also send a MIDI Program-Change message to the KP2, so each kit can get its own KP2 effect tied to it. 1 RCA-to-TS cable KP2 back to in. I chose to only use a mono loop, as at the moment I’d rather have a 3rd individual output than stereo KP2, so most programs assign my various drums into subgroups on individual outs. The box has gotten crowded with wires. My acoustic-kit-with-electronic-prosthesis is is working its way into practice with Wormrider, but it’s not ready to take out. There was ONE particular problem getting the MPC to snuggle into The PercussioNeuron slab is that it actually needs to sit higher up to get the headphone, foot-switch, and audio output jacks to clear the lip of the ATA case. 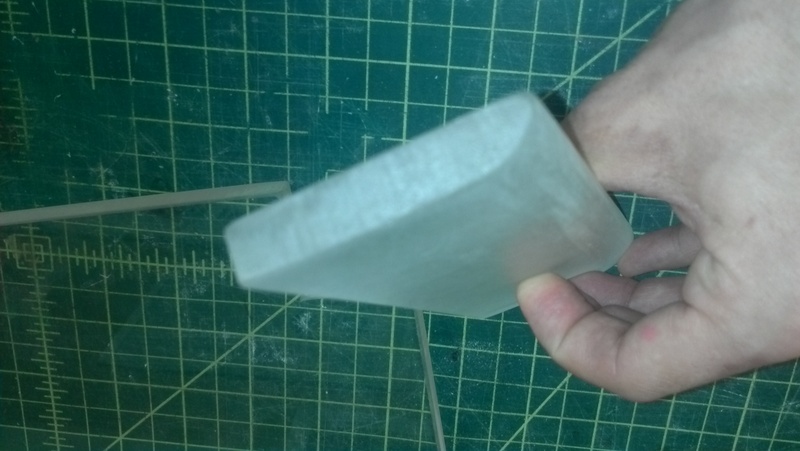 …so, in my school’s wood-shop, I made a little booster seat. …and here is the finished construction. Note the cut-ins on the corners to fit the MPCs feet, so it can keep it’s boots on for table-top dancing. …and gives full clearance for jacks above the lip of the ATA case. This new slab-based approach to the PercussioNeuron lighter, more-flexible, more self-contained with the kit. …acoustic drums armed with dDrum sensors to trigger their song-specific extra sounds. Dauz “bone” pads can be seen attached to 3-o-clock position of rack tom and floor tom rims, and the touch-pad Fx and MPC within reach to drive without dropping a stick. This had led me to move the system more freely between kits, which has got me started using the MPCs sequencer as a time-ramping metronome for building my speed.